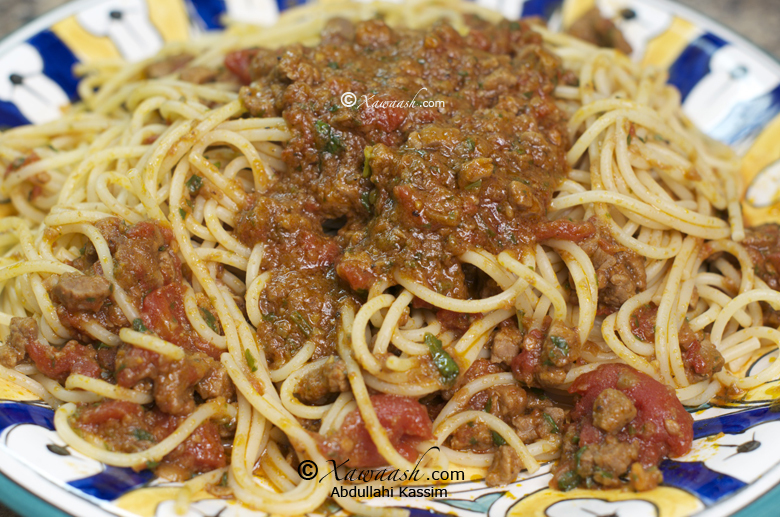 The traditional Somali Pasta Sauce is prepared with beef cut into very small cubes instead of ground beef. There were two main reasons for this. First and foremost, it was because of home economics. 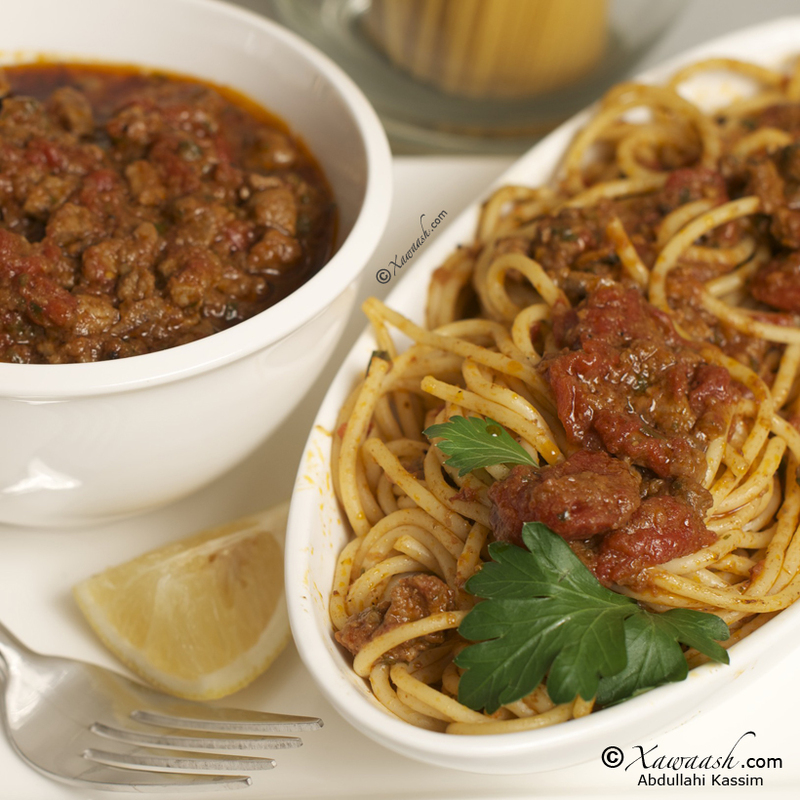 When the family members are served pasta with a meat sauce that they chew, they won’t need another meat dish to be served with the meal. It becomes an all-in-one dish. The second reason was a matter of necessity, since there weren’t many facilities for grinding meat. In Somalia, making pasta sauce was an every day affair. Shopping was done in the morning for that day’s meal. In the market you would buy a piece of meat wrapped in a newspaper, from 1/4 lb. to 1 lb., depending on the size of your family. You would also buy the fresh tomatoes. The tomatoes were not sold by weight; you would find them in piles of 4 or 5 tomatoes. The tomato paste was sold by spoonfuls and you would buy 1 teaspoon of tomato paste also wrapped in a piece of newspaper. Next you would shop for onions. Can’t afford a full onion? No problem! You can buy half an onion or even a quarter of an onion. Usually fresh tomatoes are used but we wanted to make a version with canned tomatoes for those times when tomatoes are not in season. 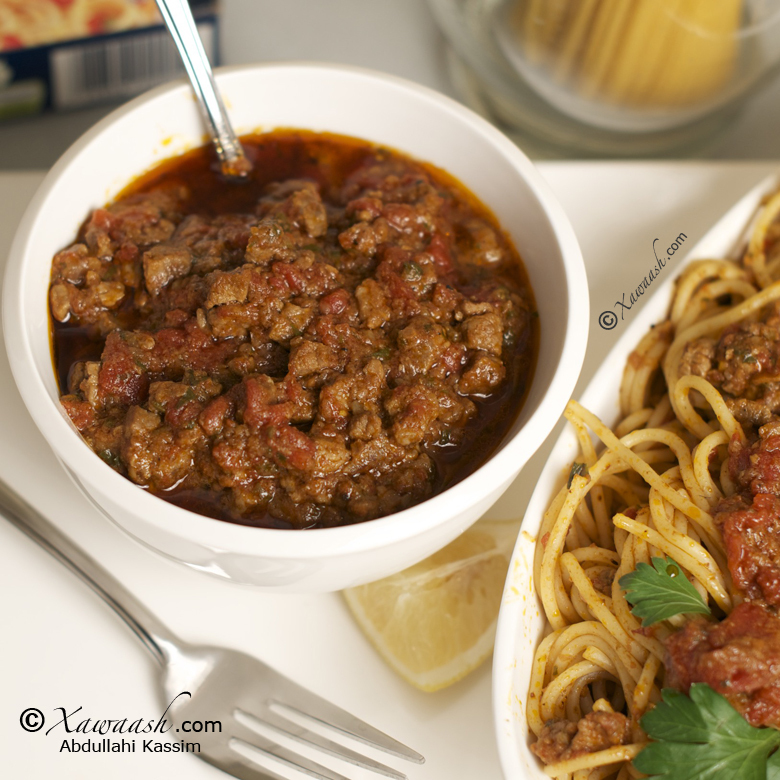 What distinguishes the Somali pasta sauce from its Italian counterpart is the use of Xawaash, which is the Somali spice mix. La sauce pour les pâtes Somali est préparée avec du boeuf coupé en très petits cubes à la place du boeuf haché. Il y a deux raisons principales à ça. D’abord, pour des raisons d’économie. Quand on sert aux membres de la famille une sauce à la viande qu’ils doivent mâcher, il ne sera pas nécessaire de servir un autre plat de viande lors du repas. Il s’agit d’un plat tout-en-un. La deuxième raison vient de la nécessité, car il n’y avait pas beaucoup de matériel pour hacher la viande. En Somalie, cuisiner une sauce pour les pâtes était une tâche quotidienne. On faisait les courses le matin pour les repas du jour. Au marché on achetait un morceau de viande emballé dans du papier journal, de ¼ de livre à 1 livre (100 à 450g), suivant la taille de la famille. On achetait aussi des tomates fraîches. Les tomates n’étaient pas vendues au poids; on les trouvait en petit tas de 4 ou 5 tomates. Le concentré de tomate se vendait à la cuillère et on achetait 1 cuillère à café de concentré de tomate lui aussi emballé dans du papier journal. Ensuite on allait acheter les oignons. Pas assez d’argent pour un oignon? Pas de problème! On pouvait acheter une moitié d’oignon ou même un quart d’oignon. D’habitude on utilise des tomates fraîches mais nous voulions faire une version avec des tomates en boite pour lorsque ce n’est pas la saison des tomates. Ce qui distingue la sauce pour pâtes Somali de sa consoeur italienne est l’utilisation du Xawaash, qui est un mélange d’épices Somali. In a food processor or blender, blend the onions, green pepper, and garlic. Heat the olive oil in a pot set over medium-high heat. Add the blended vegetables and cook for 2 minutes, then add the cubed beef. Cover and cook for 10 minutes. After all the moisture is absorbed, add the xawaash and brown the meat for 2 minutes, then add the diced tomatoes and the tomato paste. Stir well, then add the vegetable seasoning and the sugar. The sugar helps cut down the acidity of the tomatoes. Cover the pot and cook for 45 minutes on medium-low heat. When the sauce has reduced and the oil starts to surface, add the chopped cilantro and the ground black pepper. Dans un robot ou un blender, mixer les oignons, le poivron vert, et l’ail. Faire chauffer l’huile dans un faitout chauffé à feu moyen. Ajouter les légumes en purée et cuire 2 minutes, puis ajouter le boeuf en cubes. Couvrir et cuire 10 minutes. Une fois que le jus est résorbé, ajouter le xawaash et faire colorer la viande pendant 2 minutes, puis ajouter les tomates en dés et le concentré de tomate. Bien mélanger, puis ajouter l’assaisonnement légumes et le sucre. Le sucre diminue l’acidité des tomates. Couvrir le faitout et cuire 45 minutes à feu moyen-bas. Quand la sauce a réduit et que l’huile remonte, ajouter le coriandre haché et le poivre noir moulu. 1. Mixer l’oignon, le poivron vert et l’ail. 2. Les mettre dans l’huile et cuire pendant 2 minutes. 3. Ajouter le boeuf et cuire jusqu’à ce que le jus soit évaporé. 4. Ajouter le Xawaash et faire colorer la viande pendant 2 minutes. 5. Ouvrir les boites de tomates en dés et de concentré de tomate. 6. Ajouter les tomates en dés et le concentré de tomate. 7. Ajouter l’assaisonnement légumes, puis couvrir et cuire pendant 45 minutes à feu moyen-bas. 8. La sauce est prête quand l’huile remonte. 9. Ajouter le coriandre haché et le poivre noir moulu. 48 Comments - Leave a comment! Asalamu calkum, aadiyo aad ayaad u mahaadsan tihin mrwalba daad aad uducaysan ayaad tihiin . Anigu ronahantii aad iyo aad ayan ugubogay wax kasta oo aad samaysaan , waxa kale oo an dawadayash qimaha leh u sheegay in anay yarayn dadka daawaada web saidk xawaash ee qimaha badan runtii aniguba aad ayaan uxiiseya on waliba ku noqnoqda marksta mrka A&l aad ayaad umahadsantihin you guys are very talanted, i visit every single time. Wacalaykum assalaam walaal Khadija. Aad ayaad ugu mahadsantahay faallada fiican. Jacaylka ay walaalaheenna inoo muujiyeen waa mid xamaasad weyn na geliyay. Waxaan rajeyneynaa inuu Ilaahey sharafta dadkeenna iyo waddankeenna uu kor u-qaado. Mahadsanid. Wa’alaykum Assalam sister. We also use yellow onions in some recipes but you are right that you see more red onions than yellow. Red onions are more versatile in that you could also use them in salads because they have a milder taste and are sweeter. So our recommendation is to use yellow onions for dishes that require a longer cooking time, and use red onions for dishes that cook quickly, for salads, onions toppings (for burgers, etc.). Thank you for the question. Waad ku mahadsan tahay faalladaada wacan. ‘Cilantro’ iyo ‘coriander’ waa isku-hal. Labadaba waa kabsara caleen. I’m self catered Somali student,as person I normally enjoy cooking despite being metaphorically a male. I was directed to your site by my sister and I must say, I felt relieved,I felt a sense of pride! I was wondering, are there any kind of quick and easy to cook dishes which are rich in nutrients preferably Somali ones? Thank you for taking the time to comment. There are many recipes that we posted which are easy, quick and nutritious. For example you can try the Spinach, Chicken steak or Suqaar. Thank you for this recipe, i wanted to know how many fresh tomatoes do i chop up to substitute the canned tomatoes? You are welcome. You can substitute 8 medium sized fresh tomatoes. aslamcaleykum just wanted to say you guys are the best you have helped me out a great deal, jazakallah qeyr keep up the good work inshallah. Thank you very much for your comment. We are very happy that you benefited from the website. How much tomate paste do you use? I can’t see it in the ingredients. It is 2 tablespoons of tomato paste. It is in the video but we forgot to include it in the post. Thank you for pointing it out. Have a great day! Hello, I wanted to ask how many people dis recipe is for? And how much of the ingredients I would have to use for 2 people? Thank you. 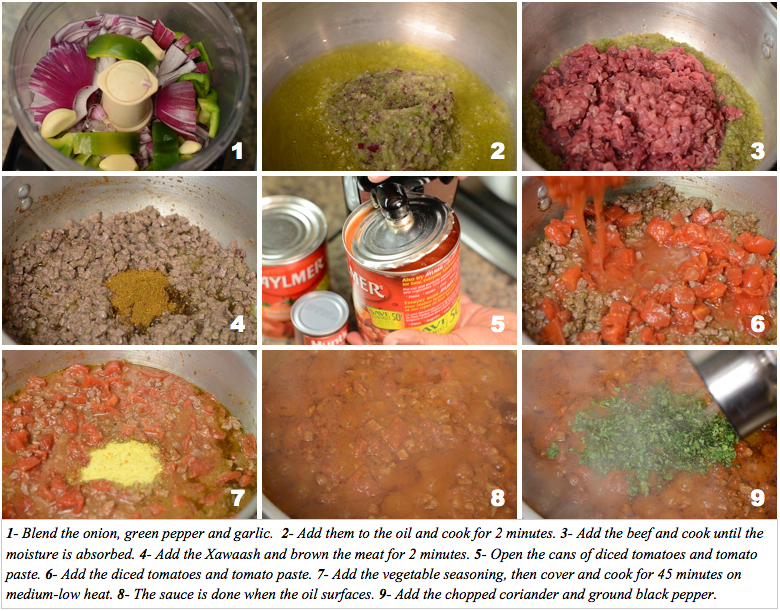 The recipe for Somali Pasta Sauce yields 16 servings. For 2 people you have to divide the ingredients by 8. However, we strongly recommend that you cook for at least 4 servings which is 1/4 of the recipe. You can store it in the fridge 3-4 days or freeze it for a longer period. Thank you. Hi, Beautiful website and I cannot wait to try out some of these recipes. I have a question about the vegetable seasoning vegeta, there are several types which one do you use? Thank you very much for taking the time to comment. The Vegeta vegetable seasoning we use is the one without MSG. I was looking for the recipes of this meal….but couldn’t find the cilantro in all major stores in London. Is there a different term for it, you might be aware of? And what can I use as alternative? Cilantro is known as coriander in the UK. Happy cooking. I thought I have seen coriander in another recipe and thought cilantro was a different. Thanks for that. I have used coriander anyway when I couldn’t find the cilantro. ASCaleyku akhiyaarta waad ku mahadsantihiin koorsooyinkaan aad nagu caawiseen run ahaantii yurub ayaan joogaa marka aad baan uga faa’ideystey inkastoo aan cunto karinta aan horay u garanayey hadana waan faa’iideystey jazaakumullaahu khayran. Waxaan idin weydiin lahaa suugadaan oo sidaas u sameysan hadaan ka reebo yaanyada kaliya bariis ama baasto sow kuma cuni karo micnaha guduudka ayaan ka reebayaa shukran sc. Adigaa mahadda mudan. Waan ku-faraxnay inaad ka-faa’iidaysanaysid. Waad ka-dhaafi kartaa yaanyada, haddaad jeceshahay bataato (baradho) ayaad ku-dari kartaa. Mahadsanid walaal. Waa ku-mahadsan tahay faallada. Waxay nala tahay doolshaha qamiirka inaad ka-waddid. 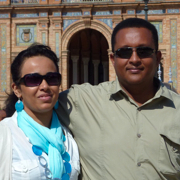 Af-Soomaali waan idin kugu tarjunnay. Thank you very much for your feedback. We are happy that you found the website helpful. Thanks guys for sharing this delicious sauce. I made a mistake of using 2 lb ground beef. But it was too much I guess, next time I will try 1 lb and have more sauce than meat . You are right, that is too much meat. We hope you will get it right next time. Thank you for sharing your experience with us and thank you for your nice comment. What size cans of tomatoes should I use? 28 ounces? The ingredients say 796 mL which is equivalent to 27 ounces. So you can use 2 x 28 ounce cans of tomatoes. Amazing sauce, I really love Somali food and cannot wait to try it!!! We hope you will like it. Thank you for you comment. Can you specify the kinds of xawaash you’re using? I’m assuming it’s curry and cumin powder but I’m not sure. Thanks for all the help! May Allah reward you guys! Here is a link on how to make xawaash http://xawaash.com/?p=12. Thank you very much for the comment and prayers. God bless you. Waa ku mahadsan tahay faalladaada wacan. asalamu alikum warahmutuallahi wabaraktu . Do I use 2 794ml can of tomatoe or just 1. It’s hard to find beef cubes how much ground beef would Substitute ? You can use the same amount of ground beef. Could you please help an inform what is Xawaash? And, if I can’t get in Germany, how to subsitute it? Xawaash is a Somali spice mix (Krautermischung). You will not find it in Germany, but there is a video posted where the ingredients and instruction of how to make the spice mix are available.